If you're an experienced sea kayaker looking for a trip that will test your skills, reveal rarely seen views, and leave you satisfyingly exhausted, then you will enjoy to explore the Panama Canal thorough the Chagres River, from Madden Lake to the Caribbean Ocean. A dam at the river's northern terminus, just before it meets the Atlantic Ocean, forms Gatun Lake, which makes up the main body of the Panama Canal. You'll hear the roar of howler monkeys from the vast jungle on your left and spot giant ships from a safe distance on your right as you paddle the length of Gatun Lake, sleeping as a guest in the huts of indigenous Embera tribes and wilderness camps along the way. You'll start off at the confluence of the Chagres River with Madden Lake to cross Madden Lake, before entering Gatun Lake alongside the Panama Canal. 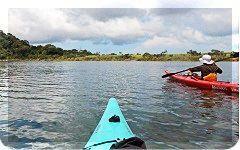 With the creation of Gatun Lake, many mountain tops were turned into islands. This area offers endless channel possibilities to scout. In its shores covered by dense tropical forest you will find all kinds of exotic flora and fauna. This was discovered by the Smithsonian Research Institute that has operated the famous Tropical Research Center of Barro Colorado since 1946, an Island you'll observe from your kayak as you paddle around it on your way across Gatun Lake. We will be driven from Panama City to confluence of Chagres River into Madden Lake where our expedition kayaks journey begins and paddle across Madden Lake, for 3-4 hours. You will paddle through the remains of a 'drowned forest,' where only the very tips of the tallest trees, that once thrived here, now barely break the surface of the water in this man-made lake. You will navigate through the water channels as you make your way to the public boat ramp of Nuevo Vigía, on the western coast of Madden Lake. Here, the driver will meet you, and shuttle you across Madden Dam to a section of the Chagres that connects Madden Lake to Gatun Lake. This leg of the trip will take around 3 hours, you'll be able to spot wildlife on either side of the river, it's even possible to see small alligators. At the end of the day, around 4pm, you'll stop at an Embera village for the night, just short of Lake Gatun and the town of Gamboa. If they have ample space and resources, then you will indulge in their hospitality, setting up camp in a hut and eating locally sourced fish. In the morning, Embera Natives will shuttle you in piraguas, this time you will travel across to the west side of the Panama Canal. From here, your exploration of the canal really begins. After 3-4 hours of paddling through dense tropical forest, you will reach the Caribbean, with a view of the old Spaniard conquistadors' Fort San Lorenzo. You will be transported back in time as you explored the remains of the once crucially important fortress, that starting in the XVI century, prevented Caribbean pirates from using the Chagres to launch surprise attacks on Panama City in the Pacific. 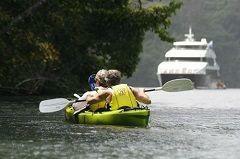 Explore the Panama Canal year-round.